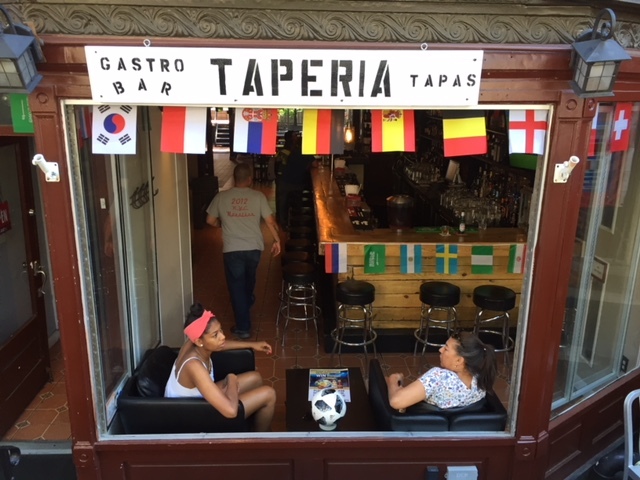 Looks like they’re decked out for World Cup viewing too. Cafe Buon Gusto across the street has always cornered that market on Montague Street otherwise. I’ve been told that the owner[s] of Cafe Buon Gusto also own the Taperia space. $12 for a vodka and soda…. Interesting – I didn’t know that. Would make sense, as Buon Gusto is always showing soccer too. It was closed on Monday night at 9:30 pm. Perhaps it is open when it wants to be open. We arrived moments after this photo was taken (Saturday) to watch Croatia-Nigeria. The lone barman was suddenly inundated with customers and held down service with a friendly demeanor and generous pours. Yesterday (Monday) when I realized I’d left something on the outdoor patio two days earlier, I was delighted to discover that he’d found it and carefully placed it in a cabinet. Just wanted to take this opportunity to give their bartender a ringing endorsement. Could be as simple as … the ECONOMY. Places like Towne Liquor or Sahadi’s always seem to be looking (via notices prominent on their exteriors) for “entry level” workers. If a place either pays poorly or has some other problem – and I am NOT insinuating that any of the 3 has such problems – an opening may not get filled in a hurry. Dishes don’t wash themselves, so it could be as simple as that – everything fits. Better be in a pint glass for that price. How much do expect to pay for a vodka and soda? Well or top shelf vodka? Ugggghhhh…I loathe Buon Gusto. Minuscule portions and poor service. Terrible combination. Agreed, I had linguine with clams, that is 3 clams in the shell, the rest were canned and the pasta was overcooked… never again.